Kylun & Captain Britain are targeted as Excalibur reluctantly aids the RCX. Awakening from a dream about his time on Ee'rath, Kylun marshals the courage to reunite with his parents, only to be attacked and captured by the Seraphim as he reaches their door. Meanwhile, at Cloud Nine, in lieu of imprisoning the captive members of Excalibur, Nigel assigns each of them a Warpie guide who neutralizes their power. He shows them around the facility, revealing that he needs their help battling a disease that is targeting parahumans. 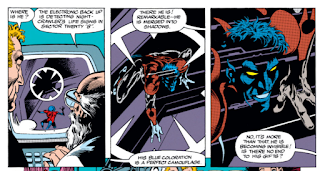 Nightcrawler offers Excalibur's help however they can. Elsewhere, Phoenix, grappling with the guilt of killing unborn life, encounters Death, who suggests the solution is to let go of being human. 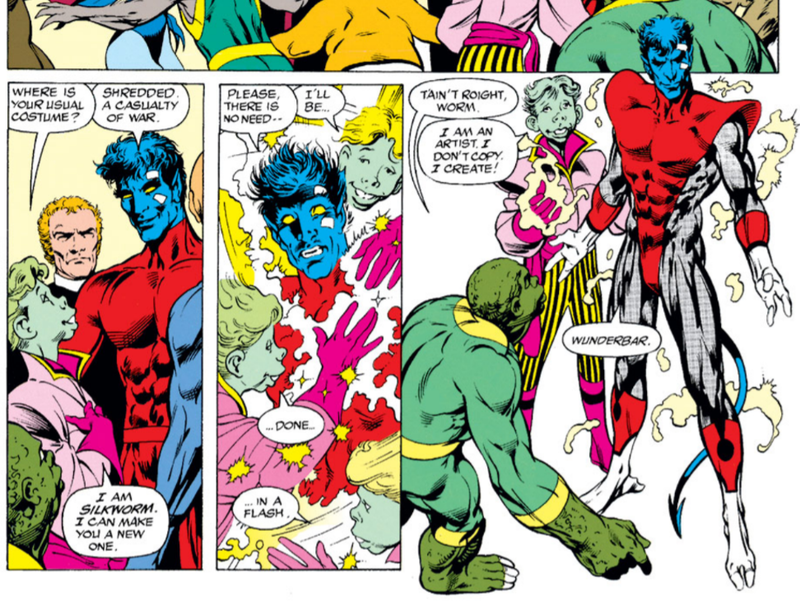 At Cloud Nine, the RCX tests' Nightcrawler's powers, and realize he is showing signs of having contracted the disease. 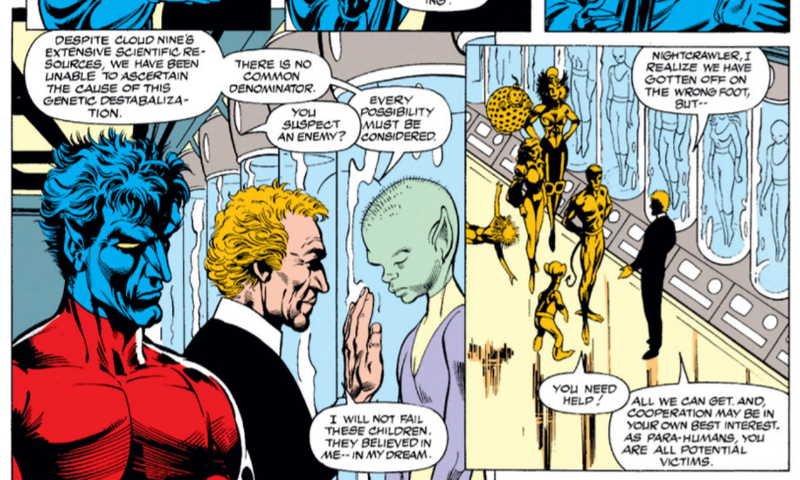 At the coast, Captain Britain's powers mysteriously return, just as another group of Seraphim confront him and Meggan. They tell him to surrender, or else. Captain Britain chooses "or else". After being absent since shortly before Sat-yr-9 and Jamie Braddock's attack on the team, Kylun returns this issue, though he doesn't interact with any of the regular characters. Nightcrawler performs a demonstration of his abilities for the RCX, leading the RCX to theorize that, due to the different ways his mutant abilities manifest themselves (including teleportation, his physical differences, and the ability to cling to walls), he may be a second-generation mutant; this will eventually turn out to be true, once it's confirmed that Nightcrawler is the son of Mystique. This issue reveals that the RCX is investigating a virus targeting "parahumans" (their term for people with super powers, not just mutants, since the Warpies technically aren't mutants), which causes their powers to burnout before killing them. This is not unlike the nascent Legacy Virus plotline in the other X-books, which also features a virus targeting mutants that will (in some iterations) cause their powers to burnout before killing them, but as far as I know, this virus is unrelated to that (I don't believe this plotline extends beyond this immediate story), the similar storylines a mere coincidence brought on by the fact that Excalibur still exists outside the editorial X-office at this time. Somewhat curiously, the Direct Market editions of this issue feature the Avengers' 30th Anniversary logo in the bottom cover box, rather than the X-Men 30th anniversary one. Cerise learns the concept of children and human procreation in this issue. When Phoenix encounters Death in this issue, one of the forms Death takes is a construction worker, the same form as in the Classic X-Men backups when the Jean Grey Phoenix encountered Death. 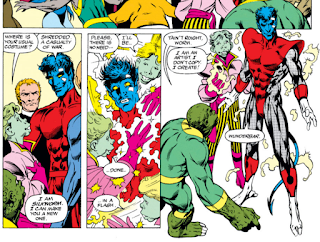 Nightcrawler receives a new costume from one of the Warpies this issue, though I don't believe it last beyond this story. As part of Nightcrawler's demo for the RCX, it's said that his agility is not tied to his mutant powers, but his whole "invisible in shadows" thing is mentioned again. Captain Britain succeeds in restoring his powers this issue, though it remains unclear why they disappeared or how he got them back. 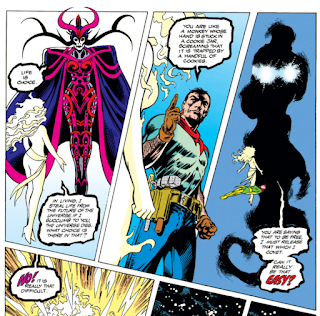 Meggan does not that his "look" changed when he was powerless, something she was reluctant to point out. 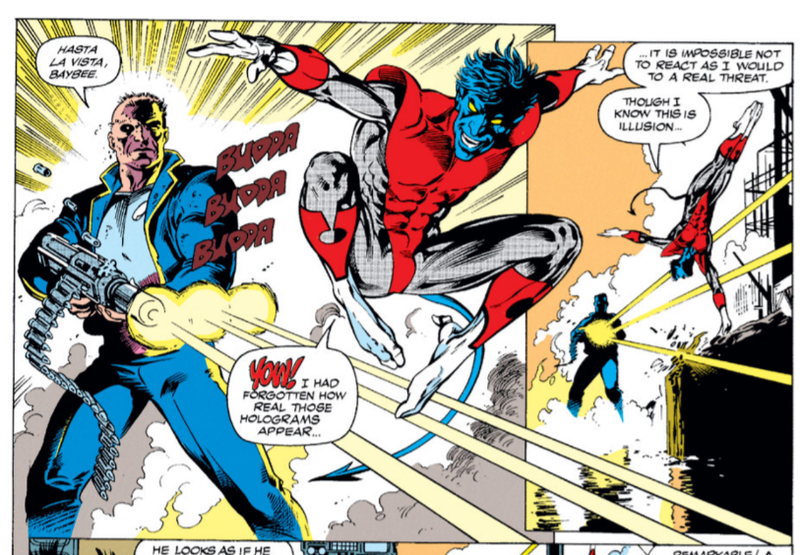 One of the holograms Nightcrawler battles during his demo is a Terminator pastiche. 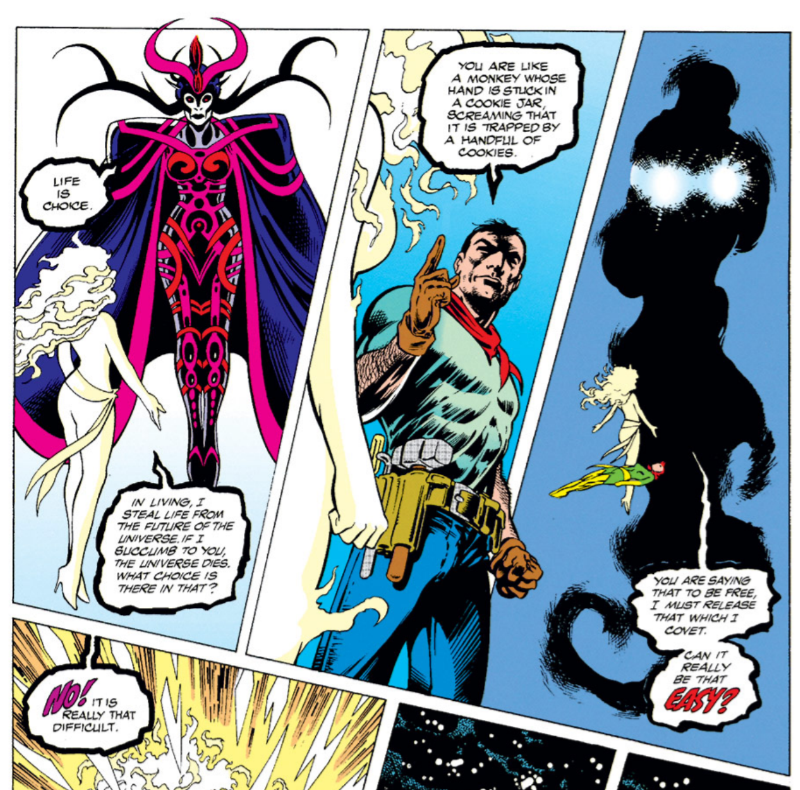 The well-drawn but relatively rote RCX/Warpies story continues here, with the RCX' attack on Excalibur expanding to draw in Kylun, Captain Britain and Meggan. But events back at RCX headquarters, including the continued spotlight on Nightcrawler (who gets to show off his abilities and receives a new costume) made me realize how, thus far, Nightcrawler really is the standout character of Alan Davis' solo run. 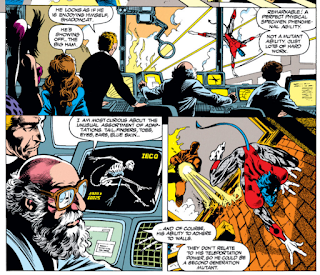 While Phoenix was the focus of his first sustained story arc, she's been absent for the last dozen issues or so, and even while she was in the spotlight, Davis was still quietly developing Nightcrawler's character in the background. Over the course of his run, Nightcrawler has discovered and developed a knack for leadership, started a new romantic relationship, and been the quiet center of the group as other characters (like Captain Britain and Phoenix) more loudly went through more overt changes. Having never read these issues before, I had always credited Warren Ellis' later run on the series with Nightcrawler's development as a leader relative to his time as part of the "All New, All Different" X-Men (and his short but unremarkable tenure as X-Men team leader during the JRjr. run); this issue made me realize most of that work was, in fact, done by Alan Davis during this solo run. Mostly agreed with your assessment; not my favorite story of the Davis run but still looks great and reads decently. Certainly light years ahead of everything else coming out of the X-line in this era. I continue to not be thrilled about the various Phoenix retcons. "Nightcrawler receives a new costume from one of the Warpies this issue, though I don't believe it last beyond this story." This costume sticks around for the remainder of Alan Davis's run (issue 67), and then I believe is maintained in a hit-or-miss fashion through "Fatal Attractions" (#71). I'm pretty sure he still has it when he fights Spoor at the beginning of that issue. However, other artists tended to disregard it, as John Romita, Jr. draws him in his classic outfit in both UNCANNY 300 and 304. These comments were written early this morning, right before news broke of the shooting in Virginia, and I feel a bit weird posting them even though there’s really no reason not to. I’m afraid that — stop me if you’ve heard this before — I possess a low tolerance for the kind of oddball, highly mutated and/or alien groups Davis specializes in like the Crazy Gang, Technet, the Cherubim, and definitely the RCX Warpies. The Cherubim and the Warpies (maybe including some or even all of the ones seen here) date from the Marvel UK Captain Britain comics, so perhaps there weren’t that many new characters created by Davis for this story, but totally apart from my personal like/dislike of them I have to give Davis credit for the willingness to create any, smack in the middle of the Image exodus and Name Withheld era. Just before posting this it occurred to me to add that while they’re a bit overly precious or whimsical for my taste in general what chafes for me most is having them exist in the Marvel Universe. Honestly, I have a not-entirely-dissimilar frustration with Kirby’s Fourth World characters in the DC Universe, much as I appreciate the original storyline and respect his boundless creativity. At least this story got me to look up the great British slang term “On your bike!” — used by Captain Britain after the Cherubim pop up. 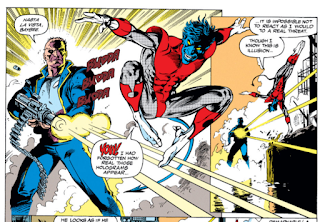 Plus, I’m happy to see Nightcrawler’s multiple powers and mutations remarked upon. The Cherubim, actually, as Captain Britain exclaims… Pretty sure the Seraphim are new as of this storyline, but I only barely remember any of the Warpies stuff from the Marvel UK Captain Britain material I read once upon a time — thought I’d reread my old TPB when Matt wrote about it but I guess I either didn’t read all of it or I was distracted enough by other stuff that it didn’t stick. 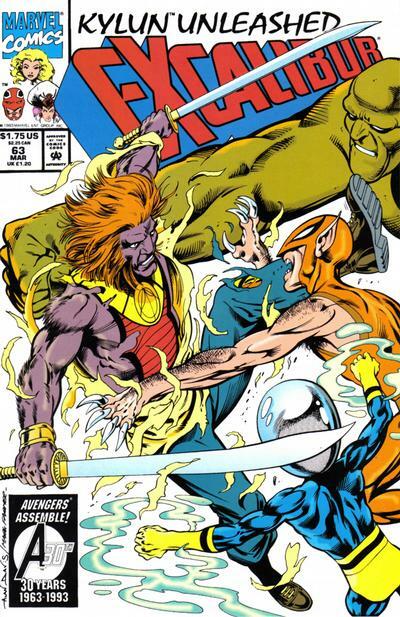 I would not be surprised if someone somewhere is trying to use that as justification for movie rights to all Excalibur characters up to this point belonging to Marvel rather than Fox. There’s seriously no further exploration or explanation? Wow. Maybe some weird opposite of the Legacy Virus is out there randomly curing mutants — and, um, their brothers — which, I submit for your approval, is how Wolverine got better. I took at peek at my comments on Matt’s Captain Britain posts; apparently I stopped reading and commenting just before the Jasper’s Warp stuff, but I don’t remember why.